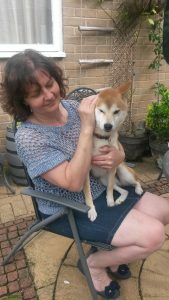 Carole died following a SCAD and cardiac arrest on 23 December 2016 aged 56. Beat SCAD talked to Matt about Carole and about his family’s plans to raise awareness of SCAD and funds for research. There was no warning that anything was wrong before Carole died; she had not complained of any worrying symptoms – her SCAD came completely out of the blue. Carole had returned from shopping and was in the kitchen when her husband Neil heard her collapse. He rushed in and started CPR and called the ambulance, however the medical team was unable to revive her. Like most SCAD patients, Carole had no risk factors for heart disease. She didn’t drink or smoke, she was active and not overweight, so Neil, Matt and twin sisters Danielle and Samantha were completely shocked at Carole’s untimely death. Shortly after Carole was born in Huddersfield in 1960, the family moved to Bradway in Sheffield. It was here where Carole spent all her childhood and met Neil when she was 17 and he was 20. In 1985 they married at St John’s church at Bradway, just half a mile from Carole’s family home, and went on to have Matthew, Danielle and Samantha. There was no doubt Carole’s main passion in life was her children, but her ‘second family’ was at Aughton Early Years Centre in Rotherham. Carole helped over 2,000 children during her time there. Her catchphrase was known to many as being “It’s all about the children”. Carole also loved family holidays in Cornwall, going to the garden centre with her Mum and Dad, meeting friends for a coffee, spending time at home with their dog McGee and pottering around in the garden. Carole was head of the Aughton Early Years Centre where she had worked for 28 years and was a much loved and respected member of staff. The funeral cortege drove past the school so staff and children could pay their respects. Many children who attended the Aughton Early Years Centre moved up to the nearby secondary school, so she was well-known by students there. When the cortege passed the school, children held up banners saying ‘Thank you Mrs Johnson’. Carole’s family had never heard of SCAD and realised that raising funds for research is key to getting closer to answers as to what causes it. 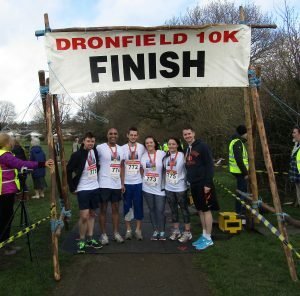 So in March 2017 Matt, his wife Kathie, sister Danielle and her partner Henry, Adam (Samantha’s fiancé) and family friends Jared and Natalie ran the Dronfield 10K to raise money for the British Heart Foundation, which funded part of the Leicester research into SCAD. They raised more than £1,200, as well as making people aware of SCAD. “Raising awareness is important,” said Matt. 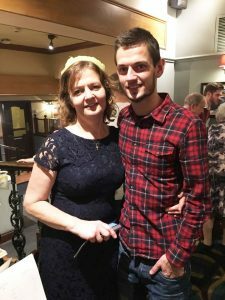 Currently aged 28, he has now set himself a challenge that will last until he is 56, the age his mum died. He will be running 56 races over the next 28 years, to raise money for Beat SCAD but also to raise awareness of SCAD. “I’m hoping over the next 28 years I can do my bit in helping to find some preventative treatment for SCAD,” said Matt. Following her death, money donated in memory of Carole totalled £6,000 and the family is using some of this to buy three defibrillators, one of which is at the Aughton Early Years Centre. It was unveiled at an event on 19 May 2017, attended by parents, staff and Carole’s family and “was a fitting tribute to Carole and her dedication to the Centre”, said the Early Years Centre. Carole will also be remembered by a charity set up by her family in her name to help families of children attending the Early Years Centre. Named using Carole’s initials, CAJ, the charity will be called Carole’s Aughton Journey.